Jennie Bayliss, who has two daughters, said going to prom could be an "expensive game"
A charity is acting as "fairy godmother" to girls who could otherwise not afford to attend their school prom.Free dresses, shoes and accessories, and help with hair and make-up, will be available through the group Faces to teenagers facing hardship in Bedford.Volunteer Lucy, 16, has helped source items for its free pop-up shop. "It can be uncomfortable and embarrassing if you can't afford it, but every girl should have the right to go to prom and feel amazing," she said.Lucy said she had tried to find items that "teenage girls like me would really like". A school prom is a semi-formal dance that originated in the USA, and the tradition has become increasingly popular in the UK in recent years.Faces - Family and Children's Early-help Services - said it could be "an expensive game", with clothes, make-up, hair and accessories costing up to Trustee Jennie Bayliss said social media was a big influence and pressure on girls. "We do not live a Kardashian lifestyle. It is all about glitz and glamour and it is just not realistic," she said. A 15-year-old, who asked to be identified only as K, said without the charity's help, she would not be able to attend her school prom. "Because of the pressure on social media, you want to be like everyone else. You just want to look good, and it costs money," she said. "You shouldn't be ashamed of asking for help; no-one is going to judge you. "Her grandmother said: "I am worried to death about the cost of her going to prom, so I am so pleased this has been set up. 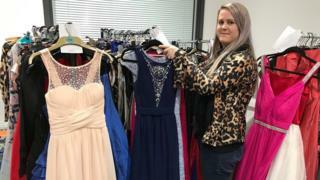 "The charity is asking that items are returned once worn so that they can be used again.The pop-up prom shop is open at Church Lane Community Centre, Bedford, on 9, 10, 11, 16, 17 and 18 April from 10:30 to 13:00 BST.